The Grouse bar and restaurant has been an institution in the mid-Antrim market town of Ballymena for decades. A multi-million pound expansion and refurbishment project marked the beginning of a new era for the popular venue in 2016, and at the time, proprietors Eugene and Carole McKenna promised that more was to come. 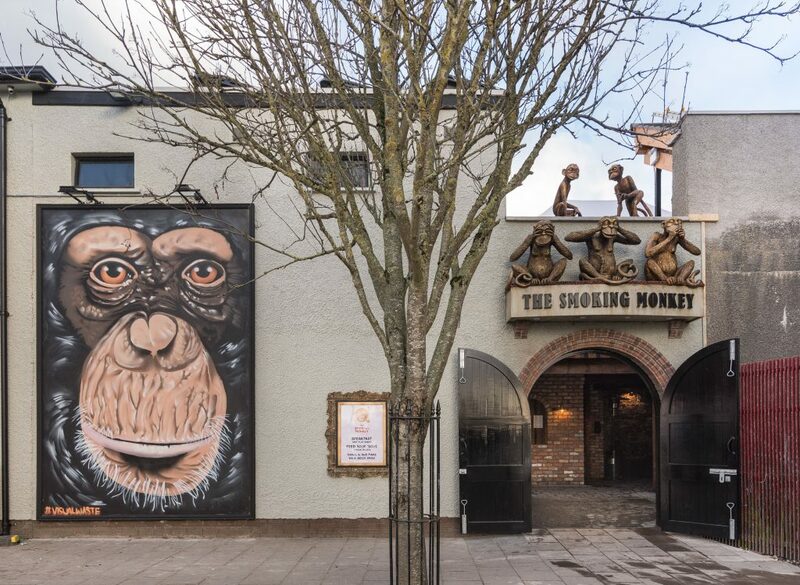 Now, phase two of the development has been unveiled as the doors open on an adjacent sports and cocktail bar called The Smoking Monkey. Also, upstairs at the Grouse itself, a new nightclub has been created. With room for around 500 revellers, Origin boasts the latest in sound and light technology and includes access to a chic new rooftop-style outdoor bar and its own VIP area. The McKennas have also included Ballymena’s first licensed café in the development. It will be situated adjacent to the main door of The Smoking Monkey on one of the town’s busiest thoroughfares. 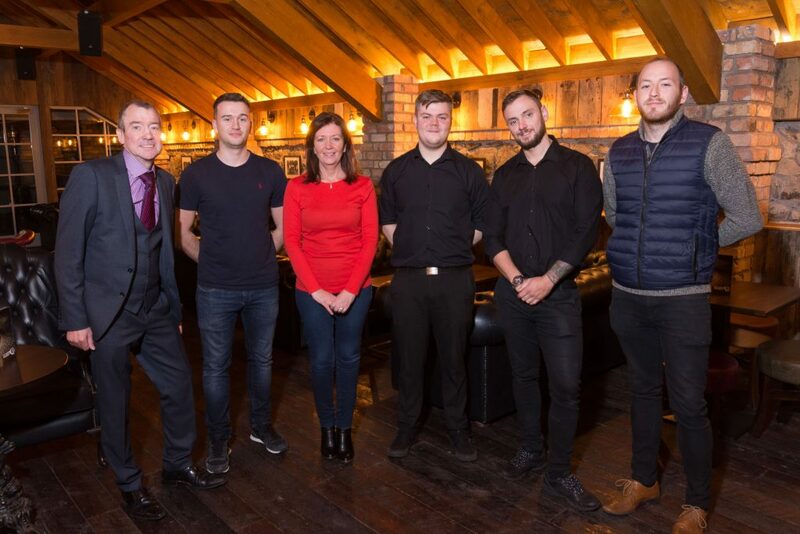 Eugene (left) and Carole are pictured with general manager, Mark McIlrath (second left) and John Crabbe, restaurant supervisor and Peter Magill and Alan Grills, bar managers. 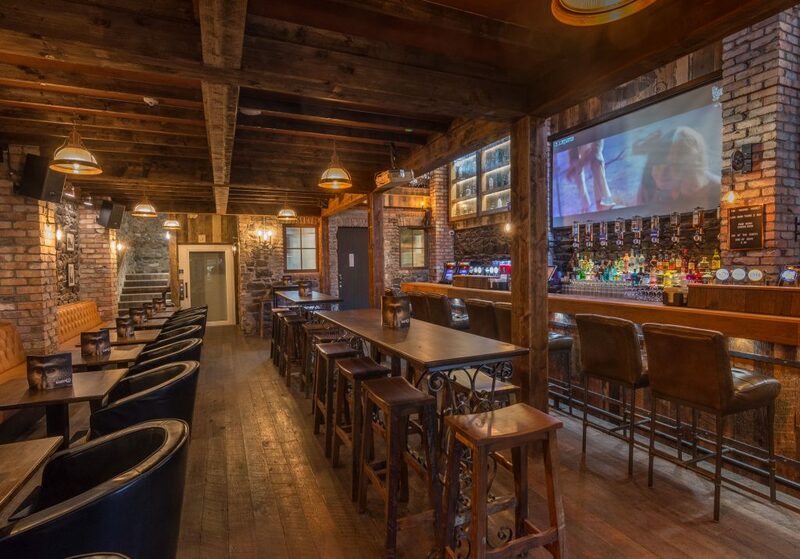 For Carole and Eugene, completing phase two of the redevelopment was critical as it re-introduced a casual sports bar environment that had been part of the appeal next door in the Grouse before the recent refurbishments. ‘People love it, they really do,’ says Carole, who describes The Smoking Monkey as ‘vintage industrial’. ‘They tell us that Ballymena really needed somewhere like this and they love our food menu, they say it really fits with the ambience of the place. The Grouse has been a popular choice for food and live entertainment in Ballymena for many years. Originally opened by the late John and Nellie McKenna as a barber’s shop and hairdressers, the premises included an off-licence from 1960 onwards. The couple’s son, Eugene, subsequently opened The Wee Grouse in 1982 and then extended the building to create the modern Grouse in 1986. Eugene himself will be a familiar face to many in the licensed trade around NI. In 1995, he bought The Countryman on the Grove Road in Ballymena, which he still owns, and for a time in the 90s, he was licensee of a number of other bars including O’Connell’s in Portglenone and The Tourist Inn, Carrickfergus. Origin – the name of the new nightclub above the Grouse – was deliberately chosen to reflect Eugene’s close associations with the building in the heart of Ballymena. Capacity downstairs at The Smoking Monkey is around 100 seated with 50 more standing. 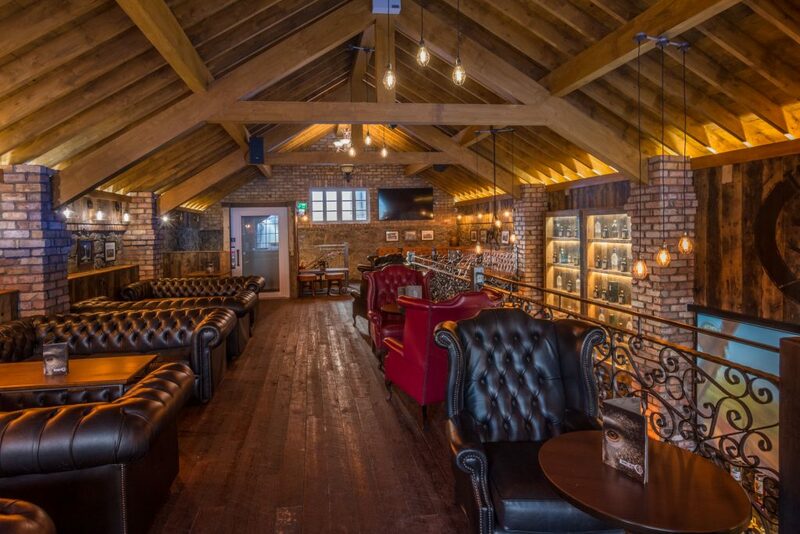 Upstairs, The Loft offers a more sedate, softer environment with comfortable leather seating and wing-back armchairs. 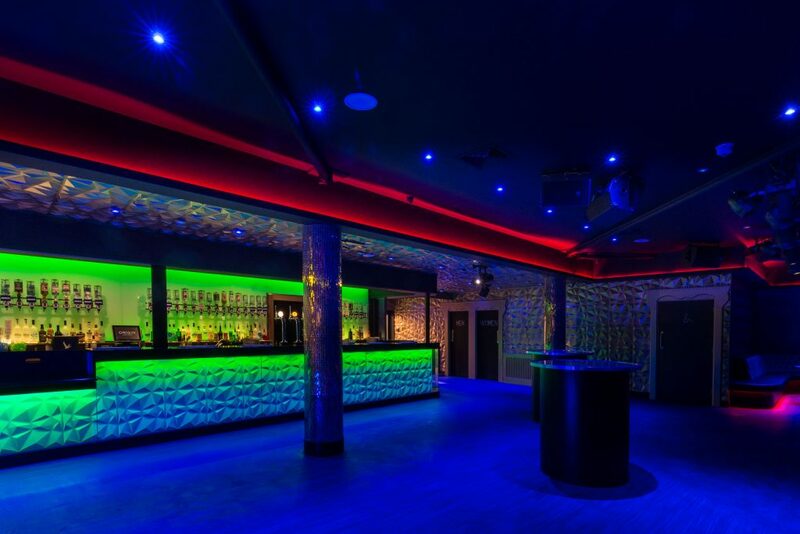 This area and the nightclub can also be hired out for private functions. 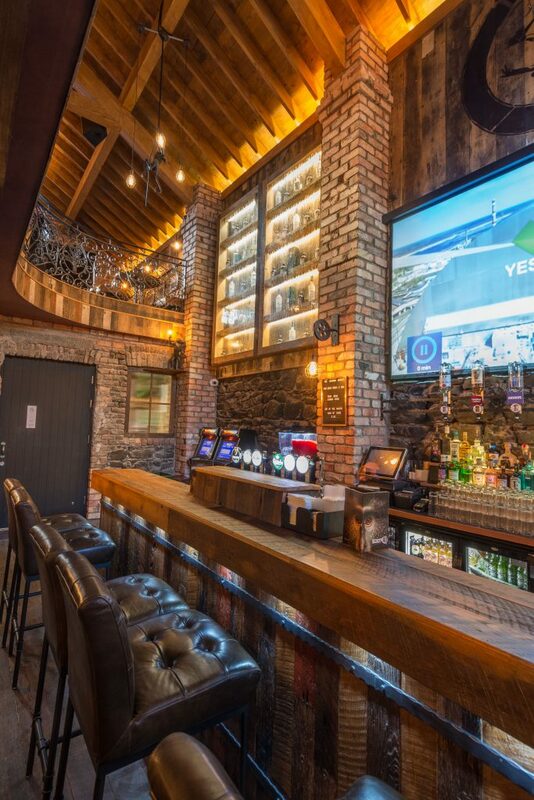 A 120-inch screen dominates the wall behind the bar, used mostly for showing sports events, and there is live music in the venue from Thursday to Sunday evenings. The little metalwork monkeys at the door of the venue have been created for the venue by Micky Murray, an artisan metalworker from Moira who has worked on creating the sets for Game of Thrones. ‘As Eugene grew up here, we wanted to be sympathetic to the original character and history of the building,’ she explains. ‘There was lots of passion and character in what we had and we wanted to be sympathetic to that, but we also wanted to create somewhere that was going to be fun and different, somewhere that wasn’t at all stuffy. Phase three of the McKennas’ redevelopment plans are also now in place. Next up will be The Countryman on the Grove Road. Well-known as a sports bar and popular for food, the venue is located on a spacious plot on the outskirts of the town. The planned refurbishment will help the restaurant capitalise on the large-party food business that it already attracts and the McKennas hope to attract more large group bookings, such as small weddings and birthday parties, to the revamped venue. Design work on the new-look Countryman will get underway in 2019, but the McKennas say that realistically, work on-site is unlikely to begin before early 2020. So far, phases one and two of the redevelopment plans have brought around 30 new jobs to the area. After the opening of phase one, business at The Grouse increased by around 25 per cent and Carole McKenna says that turnover has definitely surged again since the opening of The Smoking Monkey.